Scarpa's Flagship Ski Touring boot, the Maestrale 2.0 is still one of the most popular touring boots ever. Lighter than its predecessor and with a greater range of motion in walk mode, the Maestrale 2.0 skis and tours very well. These improvements in the touring functionality have been made without sacrificing the excellent ski performance of the Maestrale 1.0. 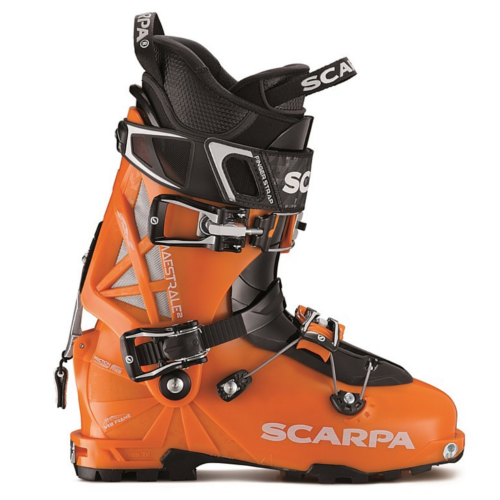 Scarpa have used some of their newer technologies such as carbon reinforcement around the cuff pivot point to improve the lateral power transmission whilst keeping the overall weight down. The Maestrale 2.0 have also been given a new Intuition liner for 2018. This high density thermo-formable foam liner gives solid heel hold and molds well, the dense foam feels like it will last well without packing down too quickly too. Scarpa have moved back to external walk / ski mechanisms such as the type found on the excellent F1 and Alien. These are easy to use, reliable and rock solid when locked into ski mode allowing zero play when flexing into the cuffs. A Redesigned buckle for the top of the instep area equalises the tension with one clip, a new top buckle folds flat when touring reduce snagging but Scarpa have kept the heel retention ratchet strap system. They still feature the genuine Dynafit Quick Step fittings and have a heel lug which is compatible with Marker Kingpin and Fritschi Tecton 12 bindings. So how do they fit? Well compared to the earlier models of the Maestrale they fit a little differently but it's not a complete change. They are still fairly low volume, particularly over the top of the instep area which was always the key area for the Maestrale. The forefoot volume seems to have been reduced a little as the earlier models had quite a lot of depth over the ball of the foot. Heel hold feels better than the earlier models, mostly due to the new liner but this also seems to have made them more snug down the outside of the foot particularly towards the rear (5th Met base) area but the shell can still be stretched here despite the carbon component. If you've had the earlier model then chances are you should be able to get a good fit from the 2.0 series but if you've tried these in the past and found them too tight over the top instep area don't expect a big difference from this latest incarnation. In summary the new Scarpa Maestrale 2.0 is a welcome update to these now classic touring boots with notable improvements whether skinning or skiing but without a big departure from the fit and functionality that have made this family of boots the most popular touring boots out there.